Natalie Hodson is a modern woman who fell into a classic post-pregnancy trap. With Jamie Eason's guidance, Natalie created a fit body and fit life for her entire family! When Bodybuilding.com launched in 1999, its goal was to sell products at the best prices and provide information from the best trainers and athletes in the business. Jamie Eason is considered one of the best guides on the planet. Her 12-Week LiveFit Trainer has helped thousands of aspiring people reach their fitness goals. One of those aspirants is Natalie Hodson. After reaching an uncomfortable 210 pounds, she discovered both BodySpace and the LiveFit Trainer and immediately got to work. Now, she is a strong and lean mother of a 2-year old son, and her story inspires friends, strangers and BodySpace companions every day. 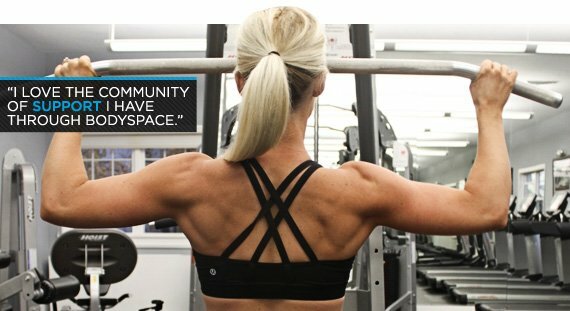 Her effort and inspiration make Bodybuilding.com proud to feature her as the newest BodySpace Member of the Month! What triggered your decision to get in shape? I have a 2-year-old son and grew to 210 pounds when I was pregnant. After I had my son, I was so happy to have a healthy and beautiful little boy, but I would always get sad when I looked in the mirror. My body just didn't look the way it used to, and I honestly thought I was probably going to have to undergo surgery if I ever wanted to look great again. I had no clue I could shape my body the way I have with proper nutrition and weight training. I was able to lose a lot of the weight with distance running, but never really looked very fit or toned. I competed in the Tough Mudder 10-mile extreme mud race and obstacle course in May 2011. While I was there, one of my friends was talking to me about protein bars and told me I needed to look up Jamie Eason's protein bars. She told me I could go to Bodybuilding.com's website and watch videos showing how to make the bars, too! I remember saying, "Bodybuilding.com? I don't want to be a bodybuilder." My friend assured me the website had a lot of great information for people who wanted to get in shape, but didn't want to get as big as a bodybuilder. I got home from that race and Googled "Jamie Eason Protein Bars." Of course, I found Bodybuilding.com and LiveFit. I was hooked! I started watching all of Jamie Eason's recipe videos and all the 360 videos. I remember feeling so inspired and motivated - I was learning things about nutrition and training I had never heard before! I found out that Jamie Eason was launching her LiveFit Trainer shortly thereafter, so I decided to do her program. I was a little nervous to try out the program. It calls for no cardio in the first four weeks (I had been a distance runner before so this was really scary for me! ), and I knew I would need to be in the weight room (something I felt uncomfortable doing). Regardless, I watched all the videos for the trainer and it got me really excited to try this program. I remember telling myself that, worst-case scenario, it was only a 12-week program. If I didn't like my results at the end of the 12 weeks, I could always go back to what I was doing before. I am so glad I took that leap of faith and tried out this new program that seemed scary to me at the time! So many changes since then! My entire family is healthier and I am happier because I have learned how to make meals that taste great and are healthy. I now eat six small meals per day, prep my food for the week on Sundays, and sometimes even set my alarm to go off every three hours to remind me to eat. I work out 5-to-6 days per week, with the majority of it weight training. I never felt comfortable in a weight room before and now, because of the exercise videos available on Bodybuilding.com, I feel extremely comfortable in the weight room! As I was browsing through Bodybuilding.com looking for articles, I realized there was a BodySpace section. At first I was hesitant to start an account and upload progress pictures. That can be a really scary thing to do! It's one thing to be able to show before-and-after photos when you are done with a program, but it is pretty scary to post progress pictures while you are in the process of getting in shape. But, I looked at other people's profiles and realized they were doing the same types of things, which gave me the confidence to create my own account. I joined a few BodyGroups and really appreciated the feedback and support I would get when I upload a progress pic or post a new fit status. How do you think BodySpace helped you reach your goals? It was really motivating to be able to scroll through progress pictures of other people who had been successful. I remember thinking: "She looks a lot like I do now in her before pictures. If she can do this, I can too!" It was also nice to get feedback after I posted new progress pictures. We tend to be the hardest on ourselves and be our own worst critics, so getting feedback from others is always motivating. Have you met any fellow BodySpace members in person? I have! I recently had the chance to attend the Arnold Sports Festival in Ohio and was able to meet many BodySpace members there! I met up with many of the girls who completed LiveFit as well as many of the Bodybuilding.com team members. What is your favorite BodySpace feature? The ability to upload progress pictures. This was really motivating for me and helped keep me accountable with my training and nutrition. What is your favorite muscle group to train? Do you have a workout you like to share? I know most people hate working their legs, but legs are actually my favorite group to train! I naturally have really big thighs and I used to hate them. In fact, for most of my life I refused to ever wear shorts in the summer because I hated how my legs looked. But, now that I started lifting weights, I started to appreciate my bigger legs. I realized that I have the ability to build nice, strong leg muscles and because my legs are bigger, I can get them to look really cut and toned through resistance training. Although working legs is probably the most challenging muscle group to train, I love how my legs look after a hard leg workout. Most of the workouts I do came from Jamie Eason's 12-week trainer. But, the exercises that I think helped shape my legs/glutes the most are single-leg barbell squats, lunges, and straight-leg deadlifts. I don't like using products with many fillers and artificial sweeteners. I keep my supplements pretty basic. I just take a multivitamin in the morning, MRM Smartblend in the morning and evening, BCAAs pre- and post-workout, and MRM Rich Vanilla protein powder after my workouts. Someone will read this feature and consider joining BodySpace. Why should that person become a part of the largest online fitness network? I love having a BodySpace account! It provides an opportunity to not only track your results and monitor your progress, but to feel like you are part of a larger network of individuals who all have fitness goals and aspirations to better their lives physically. I am someone who is really motivated by the support and encouragement of other people. When you have a BodySpace account, you can join BodyGroups that include people with similar goals. For example, some of the groups I am in are: Moms with Muscle, 0 Days Waisted, Jamie Eason 12-Week Trainer, etc. Is there anything you would like to add or say to your fellow BodySpace members?